Stay tuned for an update to this tale on Halloween! Oh and head over to Facebook & Instagram to find out my favorite Haunted House Movies right in time for Halloween! I never really thought twice about it. But this is true; for a short spell in my life, my parents experimented with a restaurant situated in a haunted house decades ago. It was a beautiful brick colonial mansion in Virginia that was converted into a restaurant on the bottom floor with the living area on the second floor. 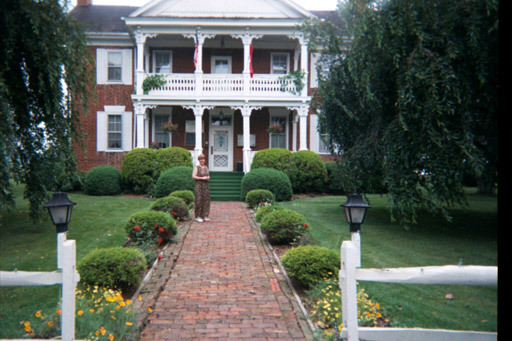 The house was amazing; it dated back to the Civil War where it was built by a doctor and his family. In the front yard, just to the right of the long driveway was a tiny brick room where the good doctor would greet his Civil War patients, perform surgeries and amputations. To add to the mystic – across the street and down a bit was a Civil War cemetery. Classic. At the time, the home was registered as a haunted house with the state and it was disclosed. This didn’t faze my parents in the least – my father was an amazing Executive Chef and the opportunity to be a part of this restaurant far exceeded the disclosure. During winter break that year, I came to visit. I hadn’t seen the house prior and I was intrigued that it was haunted. Well, truthfully I was scared to death – but so excited. It was snowing by the time I got there and for this California girl – I was cold! So the fact that the entire house was freezing didn’t occur to me as haunted! The first couple of days were lovely, the snow covered hills, the horses next door – I was bewitched by the beauty. Finally, on Christmas Eve, the restaurant was booked solid and I was left to my own devises. As the evening progressed, a huge snowstorm was coming our way when suddenly we found ourselves snowed-in. None of the dinner guests could make it and the only other employee, Billy couldn’t even go home. It was hellish out there. While the view of the cemetery from the second floor balcony scared me stiff. Low fog clung to the gravestones I had read earlier that day. Through the snow it was hard to make anything out. So what were we to do? Well, go ghost hunting of course. Billy and I started in the attic. He knew stories about the house – or maybe they were tall tales. Nonetheless we were in for a riveting evening. We took the long skinny staircase to the top floor. The wood creaked heavily as we walked up the stairs. We got to a small landing that led to a small door. Billy went first. The door was unlocked and he pushed it – it opened ever so slowly. The room smelled dank and it was freezing up there, my breath fogged before my eyes. Billy hit the nob and tube switch for a light. A tiny blub hanging from the rafters illuminated. It barely lit the corner. The attic was rather empty, there were some old wardrobes and furnishing stored up there under dirty white sheets. Classic horror movie stuff, I was scared. Shaking I couldn’t even take another step in. Then the light went off. But before I could move – I heard the laughter. A hearty laugh. And some good ole’ knee slapping. Billy had switched the light off. Haha. Very funny Billy. We left the attic and worked our way through the salon, the morning room, the entire second floor bedrooms and living rooms, the entire first floor of dinning rooms and bar and then we ventured outside. I wasn’t going in the basement. Not that night. Bundled up in parkas, thermals, hats and gloves Billy and I walked across the front lawn towards the tiny brick house. I pulled on the door. Hard. It wouldn’t budge. Was probably frozen shut. I pulled again. Nothing. So Billy gave it a shot. He pulled and pulled. The door simply creaked. He pulled again and with great effort he finally got the old wooden door open. We stepped inside this tiny room. It was maybe 10 feet by 10 feet. One tiny window – but no light came through. It too smelled old and moldy. It had a packed dirt floor. There was nothing in there and no electricity. With our flashlights we brightened every corner, our breath playing games with our eyes. Then the door slammed closed. This time it wasn’t Billy – he was standing ahead of me. I shouted – “Oh Hell No!” Turned around and with one solid front kick I blasted that heavy door open and ran. Billy right behind me. We flew towards the big house and I went straight for the parlor where my dad had the fire going and some hot totties. He had a silly grin on his face. Sometimes I think he slammed the door. I was officially done. My young teenage heart couldn’t take anymore. I was just fine watching the snow flurry from my chair in the parlor and I hung up my paranormal investigating badge. The next morning, the sun was shinning and the snow blanketed the world as far as the eye could see. It was enchanting. Even the tombstones looked pretty again. I never went back to the doctor’s office, or the cemetery and like hell would I ever venture up the stairs to the attic again. From what I heard after I returned home, Billy never set foot in the office again either. Don’t Let Buying or Selling be Spooky!